To read the full document below, please click here. Escalating food prices and scarcity in Sri Lanka and the Jaffna peninsula have caused severe food shortage. The problem in Jaffna has been caused by the restriction to fishing and agriculture in the peninsula by the declaration and maintenance of high security zones covering the coastline and also vast areas of fertile land. The closure of the A9 has crippled the economy in the Jaffna peninsula. Business men and the middle class are moving away. The closure has prevented the transport of rice and coconuts from the Vanni district and also the transport of essential items and fertiliser from Colombo. The vegetables and fruits that are produced in the peninsula cannot access the markets in the South, leading to heavy losses for many farmers. The residents of the peninsula are now dependent on unreliable and limited transport of essential food and commodities by ship from the south. The recent escalation of world food prices will no doubt also affect the situation. Overall, this has left the population of Jaffna impoverished in many ways. For the first time in recent history the children and the elderly in Jaffna are facing hunger and malnourishment, if not starvation. The elderly are dependent on their children. Some are destitute and depend on the benevolence of the temple and alms. The state handout is 100 rupees a month and rations of rice, lentils flour and sugar. This is hardly sufficient for a week or two. Children are growing up with poor weight and stature. After weaning, infants fall off the weight centile charts maintained meticulously by the Child Health Workers. Principals have reported that children attend school without breakfast and that some older teenagers faint during the day. 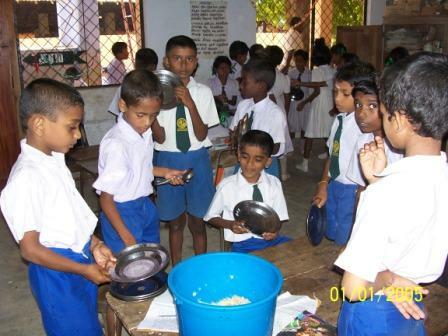 Our aim is to share the resources that we have and help feed the hungry school children in Jaffna in the first instance. Having done so, we hope to replicate the project in the rest of Sri Lanka to help feed hungry children. See the current list of schools here. By supplementing the resource provided by the WFP we could provide a wholesome mid day meal for all the children of the school including those senior students in Year 10 and above.